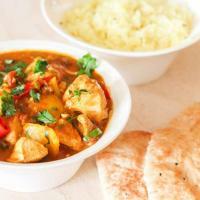 This lovely indian chicken curry with coconut milk is a guest post from Gav of Recipes for men. 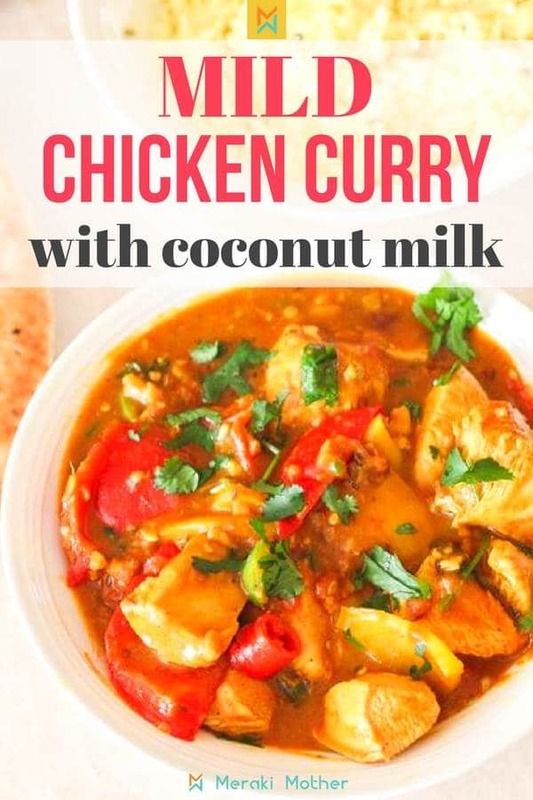 We absolutely love chicken curry recipes but this mild chicken curry with coconut milk is by far our family’s favorite. 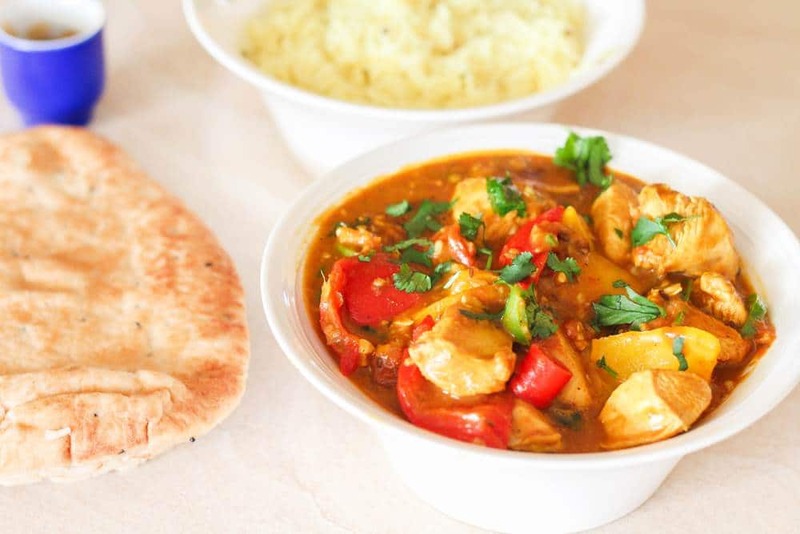 This rich, healthy meal never fails to please everyone (including children!) and is a success every time I make it. You can vary the ingredients to suit your own tastes, but the process remains the same. 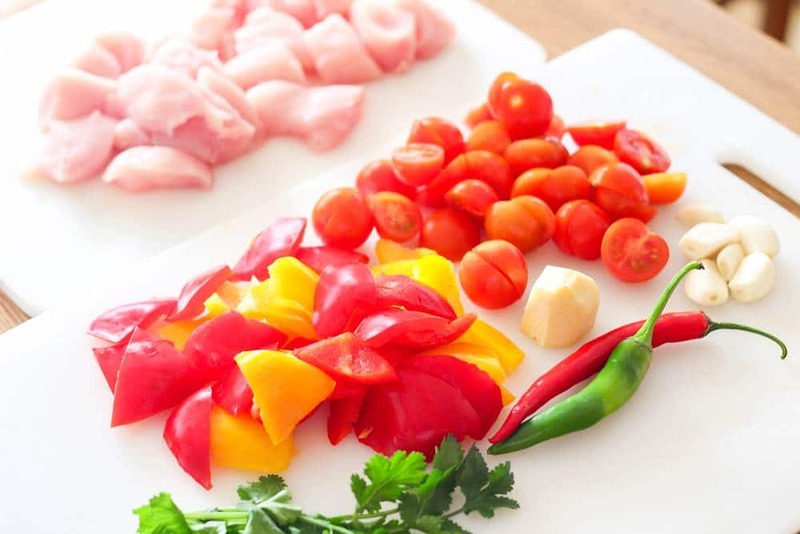 It is very easy to make and you only need a sharp knife, a good chopping board and a wok to make it. It is easiest to prepare all ingredients beforehand and then you are there to stir as needed during the cooking process. 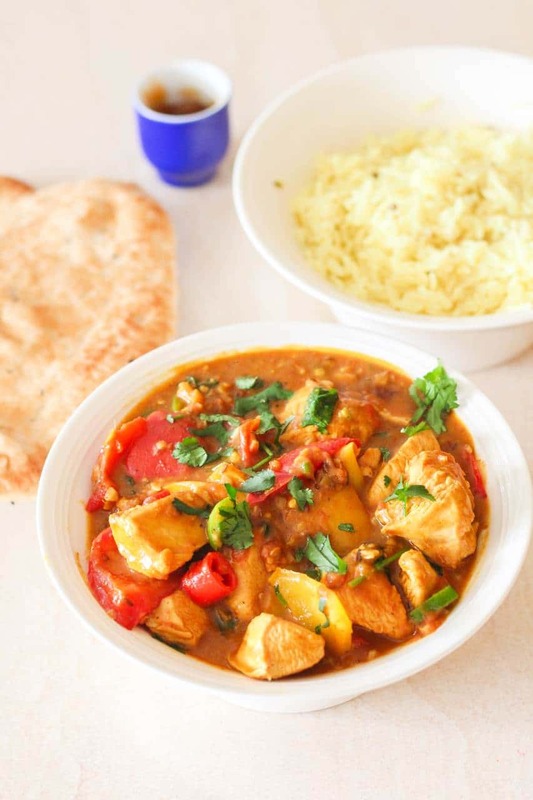 If you appreciate Indian cuisine I am confident you will enjoy this easy Indian curry recipe. 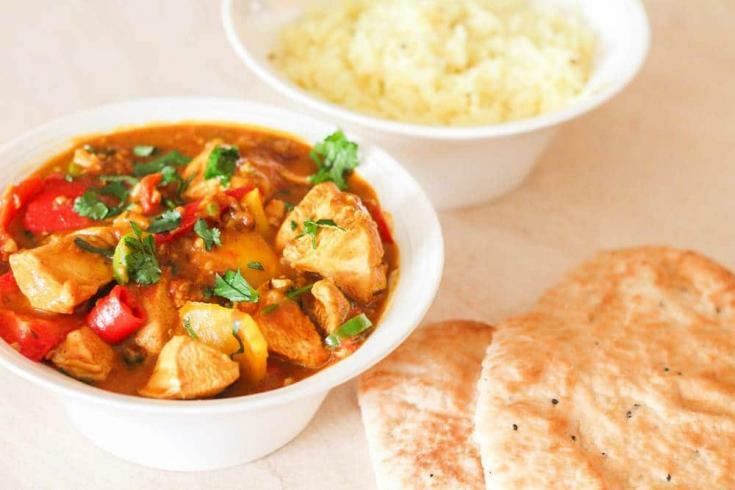 Healthy chicken curry recipe (Indian cuisine). Start by cutting and slicing up the ginger and garlic into small pieces. I tend to use a Pampered Chef food chopper for this (best birthday present I ever received!). Then heat up the ghee in the wok and fry the cumin seeds for about 30 seconds before adding the garlic and ginger. 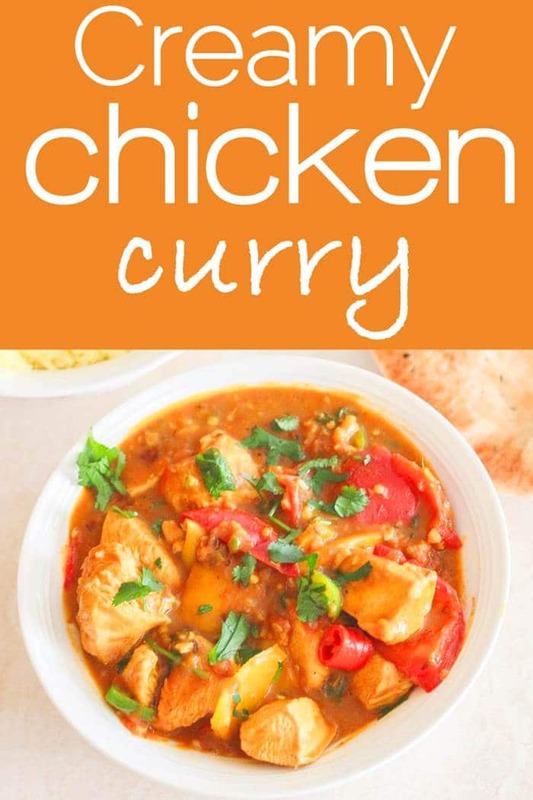 Fry this for another minute or so and then add the turmeric powder and a splash of water (about half a cup). Then add the madras paste and mix together. There should be enough water added to make sure there is enough liquid to cover all the chicken when it is added, but it should not be swimming in it. Add the chicken pieces and coat them all with the delicious paste mix. Keep stirring until the outside of all the chicken has been visibly cooked (ie no more pink parts). Then add the pepper and tomatoes to the pan, and bit by bit add the coconut milk. Stir everything together and then leave the mixture to cook for about 30 minutes on the hob on a low to medium heat. At about 15 minutes add the garam masala. It should be bubbling away nicely and will reduce down until the sauce becomes nice and thick. Stir regularly during this time. When the consistency is right, you can add the chili’s to suit your taste. Add the chopped coriander just before serving. Eat together with pulao rice and/or naan bread and mango chutney. It serves 4. 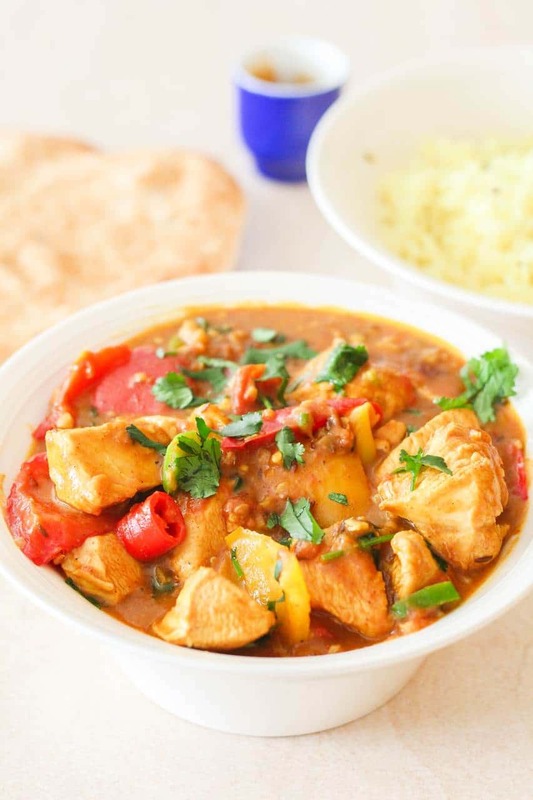 You can make this mild chicken curry recipe a lot hotter by just adding more chili. Because we have differing tastes in our family I sometimes will split into two pans before adding the chili so we have one smooth version and one hot one. If we have any left over, which is unlikely (! ), it will freeze well and just remember to add a bit of water when reheating in the microwave so it does not dry out.